:You know the drill. Somebody asks, "How are you?" and you respond automatically: "Crazy busy!" "I'm exhausted!" "Running too fast." And it's no wonder! Between the breakneck speed of your job, the one million family activities on the calendar, the volunteer luncheon you signed up to host, the growing to-do list on your phone, and the workout you've been meaning to get to for weeks-if you ever stopped long enough to think about it, you'd be curled up in the fetal position on the floor. Life these days. It's exhausting, isn't it? Ellen Miller gets it-and she wrote Spread Too Thin just for you. Whatever stage of life you find yourself in, you don't have to live it frantically. Written for women who care deeply and extend themselves selflessly, this 90-day devotional offers an honest look at the obligations that have drained us and then point us toward a more abundant life with Jesus. Through personal stories, practical insights, and classic Ellen humor, you'll discover that it is possible to find hope-and even peace!-throughout your harried, overcommitted days. 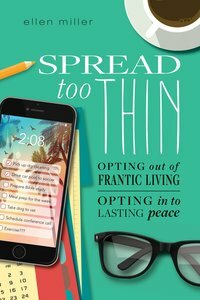 About "Spread Too Thin: Opting Out of the Frantic Life. Opting Into Lasting Peace"
Miller has a masters of fine arts degree from New York University.